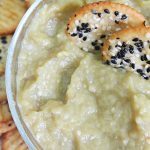 This creamy roasted eggplant dip is perfect for parties as appetizer but makes a great healthy snack too. 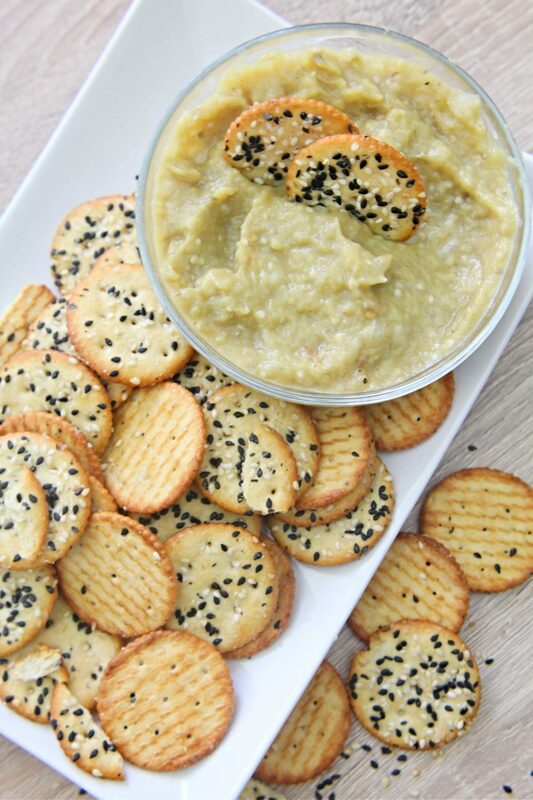 Eggplant dip is the perfect spread for pita bread or on whole wheat toast but it tastes as delicious with crackers too, my favorite being mixed seed crackers. I haven’t entertained in ages but that’s no excuse to skip this yummy eggplant spread from our meals. I like to have a few snacks throughout the day and I need to diversify the options or I get bored and end up eating junk. 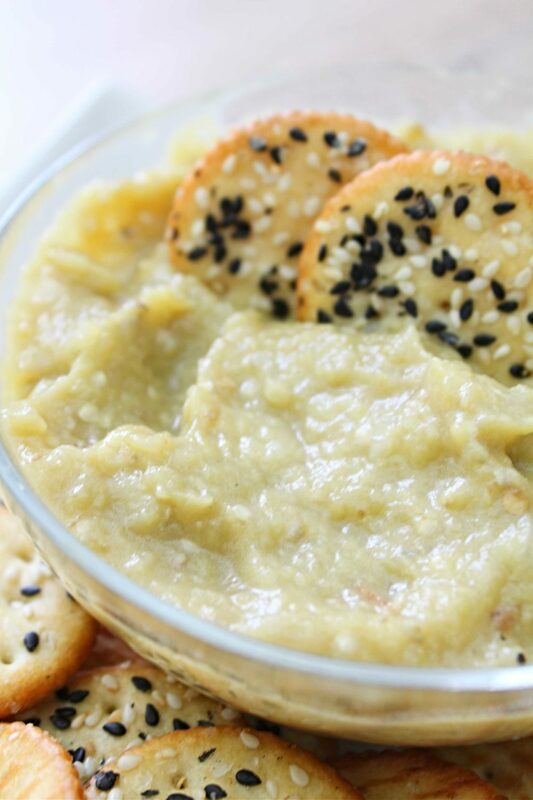 This eggplant dip makes a great quick snack for me, it’s healthy, full of flavors and very nourishing; a tablespoon of this baba ganoush dip, spread on a slice of whole wheat toast is just enough to satisfy my need for snacking and gives me plenty energy. 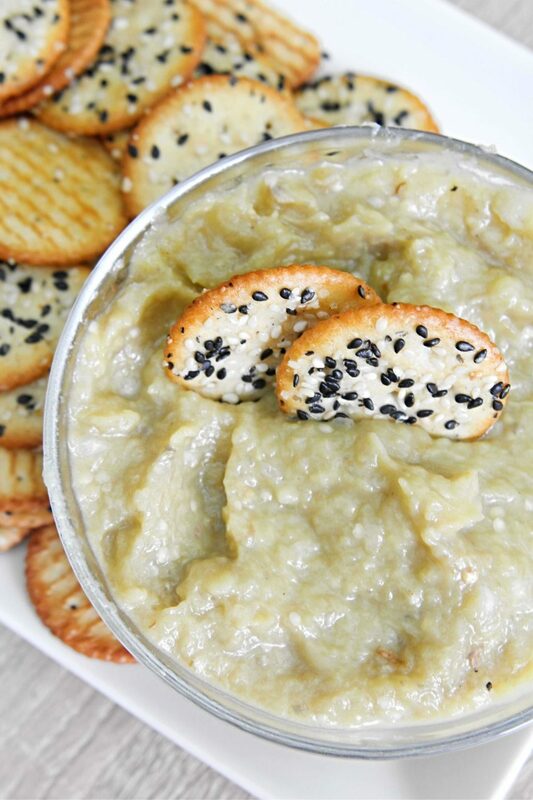 I like to make my eggplant dip with roasted eggplant, it makes such a big difference. When you roast eggplant in the oven, it takes on a smokey flavor that adds depth to this eggplant dip recipe. Roasting is also a simpler and healthier method of preparing these vegetables, giving them a special flavor while still keeping them nutritious. 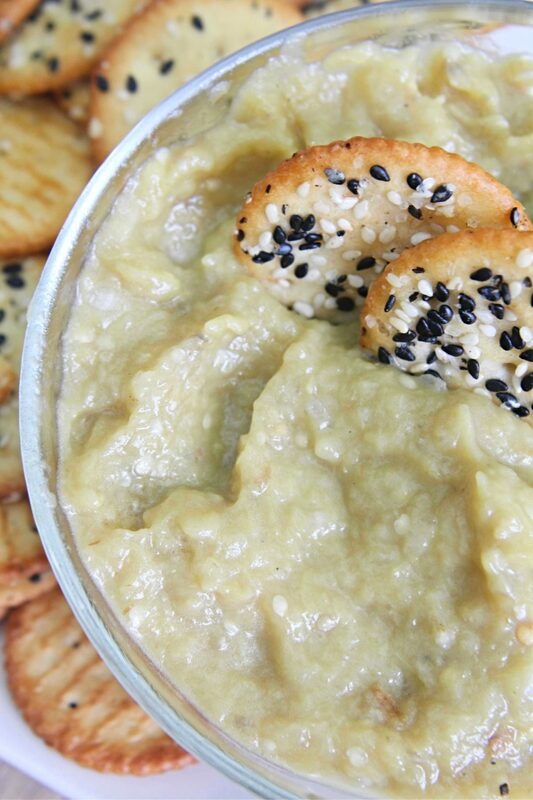 An eggplant dip is a quick, fun, healthy, alternative way to spice up an otherwise dull eggplant. It gets better in a day or two, while flavors develop and blend. The best proof that this eggplant baba ganoush is an amazing food is my picky daughter; she totally enjoys it! 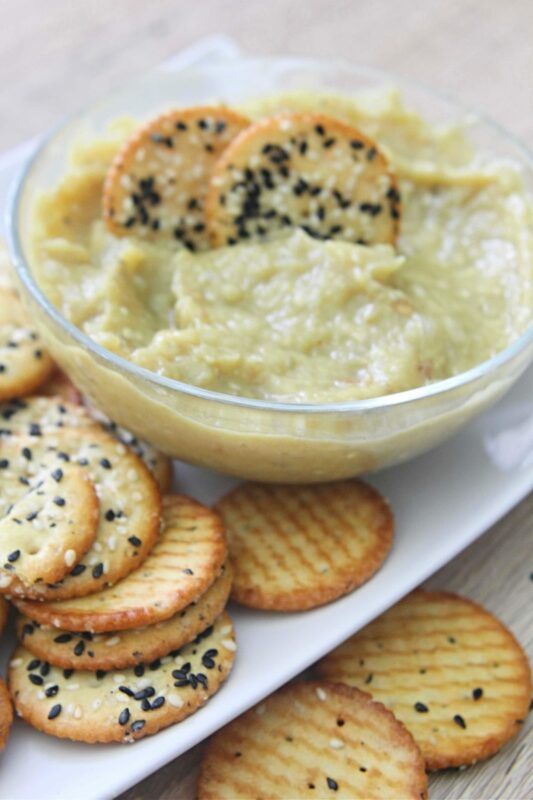 This roasted eggplant spread is awesome! Lightly prick the eggplant to prevent them from bursting while in the oven. Leave to cool until you're able to touch the eggplant without burning your fingers. Press out as much of the juice as possible. Finely smash with a knife until you get a paste like, smooth mixture. Strain again. Make sure all water is out before starting to prepare the dip. Start adding oil, a few drops at a time and mix well to incorporate. Only then continue adding oil, gradually. Add mustard and mix to combine. 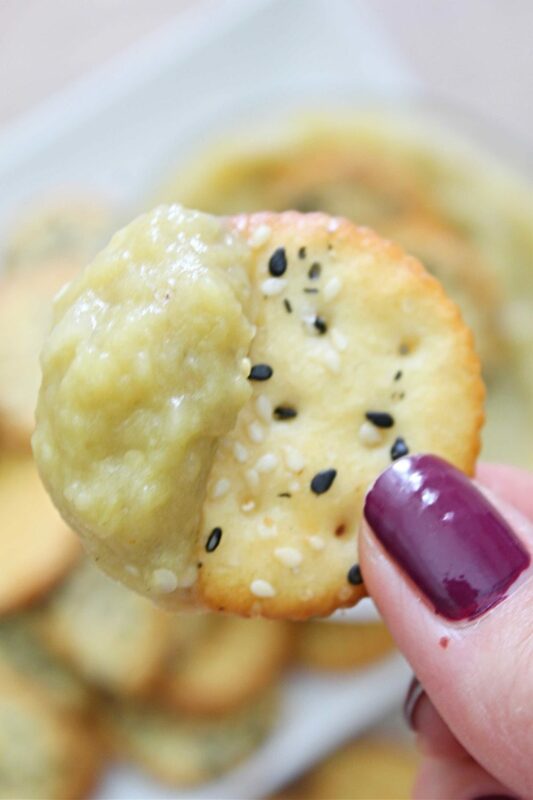 Serve cold with crackers or pita chips as a dip or spread on bread or crostini. Leave to cool until you’re able to touch the eggplant without burning your fingers. Finally add the finely chopped onion and mix well to combine. 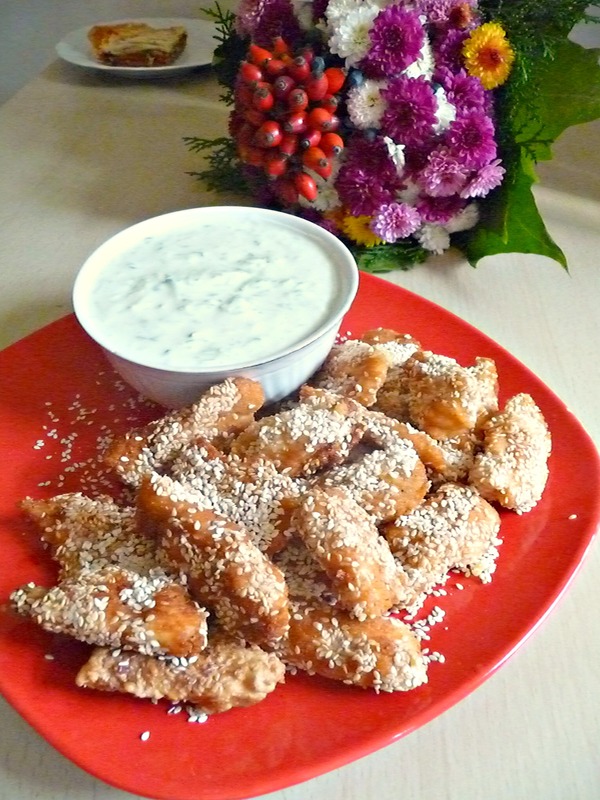 What a great appetizer, this is awesome! Hope you are having a great day and thanks so much for sharing with Full Plate Thursday. 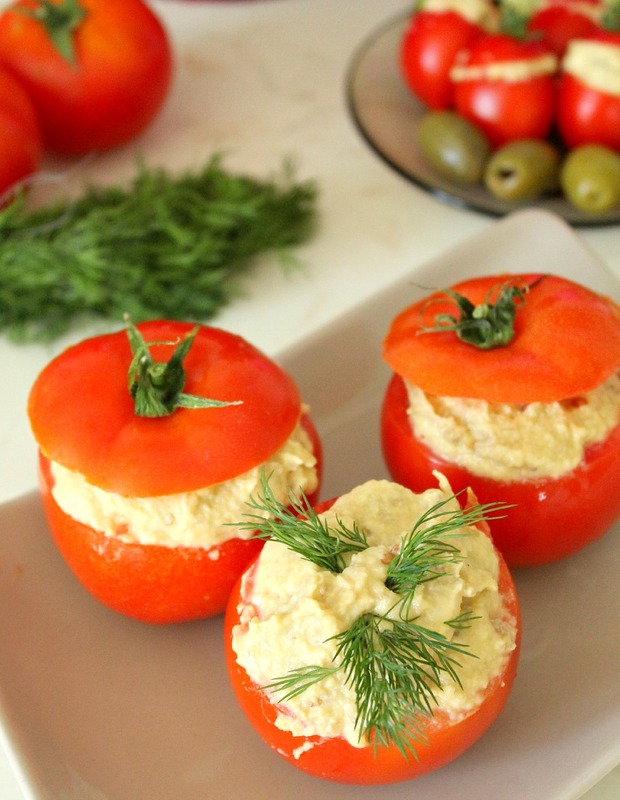 THIS spread would be PERFECTION on chicken breast! !